Posted by elizabethwong in Current Affairs, Malaysia, Note2Self. Way, way, way before Negarakuku was made, Namewee was already famous for “Muar Chinese”, which had garnered 600,000 views back in April. Now with the latest hysterics, the musician has had death threats issued by Malaysians on YouTube pages, even for this earlier song. There’s nothing really offensive about his recent work and (probably) this one, but what the heck was running in his mind when he decided to use the national anthem? I guess sensitivity doesn’t blend well with creativity for some. Our government should have just let the whole thing go and it would’ve been forgotten overnight. By beating the big stick around, they’re just drawing attention and helping his popularity. in truly asia everything is sensitive. Sensitivity is an essential ingredient in a tolerant community. Sensitivity to people’s pride, religion and country. Yeah…let it go, it will be like water under the bridge…it comes and it is gone. sensitivity is such a nice word. Was kerismuddin and gang sensitive when he unsheath his keris and threathen the other races? Was Bocor Bung and one eyed jasin sensitive when he ridiculed women? Was the religious authourities sensitive when they labelled a girl najis? Was an imam sensitive when he called for chastity belts for women? Was the police sensitive when they enforced tudung for everyone? Yes sir, sensitive is a very nice word. Playing with racial and religious sentiments as always when election is near. A party that doesn’t know how else to bring its people of multi racial and religious compositions together!!! What use is this party when all they do is beyond the right and fair mind of people in general? Another distinctive reflection of the useless policies spawned by the useless dpm’s father!!! “Sensitive issue. 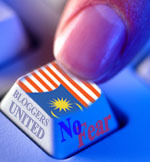 Don’t touch it” …the famous words of UMNO’s words for decades. Yet blasting others and appearing as an “All Saints Party” seems to be played over and over again with such thick skin faces. Look at TDM still blasting and teaching America. Can such a famous trouble maker and corrupted reputation do it? Sure can…as long as UMNO member. Again…..who to blame? THE VOTERS…so why complaint? Perhaps all complaining here realize the wrongs and did their part to vote against them. Then …not enough realizations in Malaysia. The BN great work to play race and religion is still working. It will be corrected if all BN parties are grouped into one by UMNO. So easy to be united and become Malaysians. I love the song. Well done, brudder, show these Barisan idiots what you are made of. All, I don’t know how you look at him and how our government look at him. I think this Namewee is very creative and in fact, very valuable. Too bad he is born in Malaysia. Well, good that he born in Malaysia, because he learned the culture here and grew up here, and that make him unique. His skills worth millions in US. He can really do something to be R&B star! Malaysia is just not ready for him. Brain drain? Yes, he is one of the example. We have lost a great artist. BTW, we don’t just lost him. Also he co-producer who make these clips. May be more other people we don’t know. The government should realize the message beneath in the movies. It isn’t anti-government. It merely showing the facts of our Malaysian culture, from the perspective of him, with some despair, and hopes. If our government could use his talent to make patriotic movies for the country, I believe it will be very stunning and attract the youngster to love the country more. Punishing him only get things worst. jean….That’s one flew over the cocoo nest talking. How the hell did someone come to the conclusion that I thought that whatever UMNO or BN did in the recent past was sensitive? Just because some amateur politician were acting in an insensitive manner, does it warrant us to do the same thing? Does it then mean we should and could stoop as low as these fellow front-benchers? Sensitivity maybe abused to suppress certain expressions – i agree. This is perhaps due to the myriad value systems that defines sensitivity. But wouldn’t one agree that the use of the national anthem of his/her own country in this manner is a bit overboard? Would it be justified, if a fan burned the national flag as a form of expression to protest against the nation’s football team performance? One more thing…did I mention before that monsterball’s comments are downright silly and prejudice. This twerp thinks that everytime someone writes something contradictory to the majority of blogger’s mainstream ideas are conclusively a BN or UMNO lackey. And besides, this is not about UMNO. Why the hell does everything have to revolve around UMNO? We can’t even have a decent discussion or debate when people start nit-picking and carping like this. well, as a mass com student, this guy do learn how to get famous through the shortest route. Do something outlandish, cause a stir, touch a few nerves. I do agree with Mohammad Yunos. I am not excatly a fan of umno but I am not amused with this guy either. Taken from MToday. The transcript of Negarakuku. Another entry to the Malaysian Book of Record and the only Chinese song that attracted the interest of the most number of non Chinese here and elsewhere.Some might have even learned some Hokkien words along the way. Malaysia Boleh. (Repeat) Check it out, yo, yo, yo. It only depends on what kind of nostrils you have. Also kopi-O, want to add sugar? Rakyat hidup bersatu dan maju. With no car, how do I go out and play? This country, I like it very much. Because you see some children are still not weaned off breast-feeding. And he won’t scold you one lah. Because this is their attitude in life. But my mouth still sings. This is not just about UMNO. Its about racists supremacists bigots that are running this country propogating their racist agenda, and sadly, because they control what is being thought, read, written, these ideas are gaining much popularity. Its about what is wrong in this country, and the government (UMNO) which plays a major part in this country is responsible for this. I just wish some segment of the population would just stop making call for sensitivity to their cause while never being concerned or sensitive to others. Those that needed to be sent for sensitivity training include the religious authourities in this country who think they have god given rights to harrass and humiliate others. OK, I tried to translate. in bolehland small issue they will make it very very big and big issues to biasa lah..!what a bunch of losers..
as i can recall few years ago when the indonesian factory workers burn the malaysia flags.what actions did the gomen take?ah..close one eye lah.., kah kee lang..!! Who doesn’t know umno was the one spawning all craps know to citizen in this country? This guy is just speaking his mind as it is – first hand experience. He is not the root cause but the consequences of crappy generational policies inspired by umno. The intention runs deeper, only time will tell. He ate too much betel nut . If he was acting nut, I don’t think he deserves so much publicity. A private citizen without any political affiliation acting nut, I won’t be losing any sleep. What if he says he was singing “negaraku cool”? Why is everyone arguing about sensitivity, the government, Barisan, Umno, lashing out at anyone and anything? This guy did nothing but to sing. You get all sort of crap on the internet these days with the open source and endless information. If you don’t like to watch something sensitive, then don’t watch it. They just put it there. They did not force us to watch it. Same goes with blogs. Stop using this to lash out at anyone and anything and stop saying that it is sensitive. I can write a blog about SM and it is sensitive but no one force you to come and read it.